These words of fatherly advice helped shape Ted Turner's remarkable life, but they only begin to explain the colorful, energetic, and unique style that has made Ted into one of the most amazing personalities of our time. Along the way - among his numerous accomplishments -- Ted became one of the richest men in the world, the largest land owner in the United States, revolutionized the television business with the creation of TBS and CNN, became a champion sailor and winner of the America's Cup, and took home a World Series championship trophy in 1995 as owner of the Atlanta Braves. You'll also hear Ted's personal take on how we can save the world...share his experiences in the dugout on the day when he appointed himself as manager of the Atlanta Braves....learn how he almost lost his life in the 1979 Fastnet sailing race (but came out the winner)...and discover surprising details about his dealings with Fidel Castro, Mikhail Gorbachev, Jimmy Carter, Bill Gates, Jack Welch, Warren Buffett, and many more of the most influential people of the past half century. Ted also doesn't shrink from the darker and more intimate details of his life. With his usual frankness, he discusses a childhood of loneliness (he was left at a boarding school by his parents at the tender age of four), and the emotional impact of devastating losses (Ted's beloved sister died at seventeen and his hard-charging father committed suicide when Ted was still in his early twenties). Turner is also forthcoming about his marriages, including the one to Oscar-winning actress, Jane Fonda. Along the way, Ted's friends, colleagues, and family are equally revealing in their unique "Ted Stories" which are peppered throughout the book. Jane Fonda, especially, provides intriguing insights into Ted's inner drive and character. 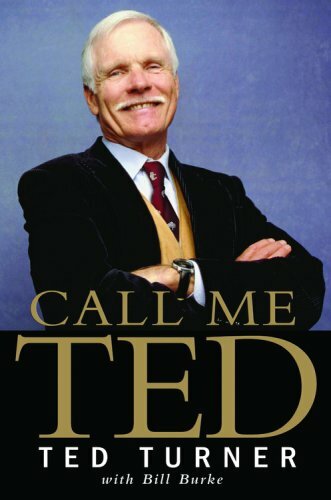 In CALL ME TED, you'll hear Ted Turner's distinctive voice on every page. Always forthright, he tells you what makes him tick and what ticks him off, and delivers an honest account of what he's all about. Inspiring and entertaining, CALL ME TED sheds new light on one of the greatest visionaries of our time. I feel like I know Ted after listening to this book. Ted Turner Tells It Like It Is! For anyone interested about how cable television got to be where it is today, this book is a must read. Ted Turner doesn't hold back and tells it like it is. Especially interesting is reading about the moves Ted made to create the great cable stations we have today like CNN. Ted Turner is a good reader! If not for that, this would have been a bit tedious in spots. He tells his story more from a business stand-point than a personal one. I would have preferred more of the latter. Mr. Turner's autobiography, with an able assist by Bill Burke, is a non-stop read, revelling in the life of a central player of the communications industry. Poignantly presented with a strident effort towards transparency, CMT rushes the reader through the life of a man searching for it's meaning. This is not his stated purpose but rather the question begged of what indeed makes Ted run? His atom-smashing approach to life is noted by ex-wife Jane Fonda as just the way he is. USA Today reviews the work as the best business book of the year. And the fascination of opening the innards of business communication machinations holds one captive throughout. Importantly, the reader is introduced to Mr. T's career in advertising through the then twelve-year-old's post-hole digging for his father's billboard company. Those who claim to have started from the ground up will probably have to get in line after that revelation. But that which tangles the observer in wonder is Mr. T's absorption in life itself. He's truly sorry, happy, amazed, saddened, touched, and everything else by what all he experiences as he dashes pell mell through day after day. Sailing excerpts from the America's Cup to Fastnet to just messing about in boats, rewards all who pass this way with feeling the icy waves to sweating out the shivering nights waiting for rescue, sunrise and survival. Tumbling straight into the reality of .Com, the author/presenter leads all followers to the exponential clatter of communications now extant. Along the way, effortlessly woven into the fabric of his testimony, Captain Courageous plumbs the depths of life's meaning. Mourning the death of his friend, confidante, father-figure and life-long ally, Jimmy Brown, he eulogizes from the old song, "...Lead us not into temptation, may his soul find the salvation of thy great eternal love..."
Of all the considered epitaphs mentioned through the telling of the tale, this last garners the profit Ted is after. With that, the losses chronicled, which are many and fully displayed in detail, won't really matter in a hundred years. Thank you Mr. T. Hope to meet you at the Shout ! Distant Reaches The Hard Copy Edition of True-Life Adventure in Ireland, Boston, Cape May and on the North Atlantic. When Now Becomes Too Late The Kindle Edition of A Futurist Consideration on the imminence of the Rapture. When Now Becomes Too Late The Hard Copy Edition. I like biographies, and this one came to me highly recommended, by a friend who has many years of business experience. I've just finishing listening to the audio CD version, which Ted reads himself (a feature I really like). I appreciate the candid view of Ted Turner, including the ups and downs in his business and life. Also, the insight into his vision and strategies from a high level. The "Ted Stories" was also a great feature, to get the 360 degree view. The book reads quite well, and could be an inspiration for a balanced teen as well as a confidence builder for those older who are about to leap into business. Ted took risks, and the many references to him getting on his knees to get a deal done. He was not worried about what other people think when it mattered. There are so many things we do not do because they are unconventional, ted threw that playbook away. As we go through this economic downturn, we have may people who are still spending money on things that make them look good, instead of making drastic adjustments, painful adjusrments. Ted partied a lot, but he made sure his kids knew what hard work was, after they proved their worth he rewarded them very well. I love the book, and could be a good companion for anyone on a transatlantic flight for instance. It will have you laughing here and there as well. I have also read Sir Ricard Branson's screw it lets do it. Now I wish I had one by Steve Forssett. The three of them are cut from the same cloth. They work hard, have fun and have been successful. I also credit their wives who seem to have stayed out of the picture and let these gusy flourish. I found this book to be an honest, forthright, biography of Ted Turner. Having followed his life as an Atlantan, a Southerner, and a man of the world, I could imagine his saying the words on the pages in his sometimes humble and often brash manner. I was particularly impressed by the inclusion of the variety of comments by family, business and personal associates throughout the book as they fit into Ted's own story. I am not normally into business biographies (having read way too many of these in business school), but this one is fascinating. I liked that the bulk of the book is spent on earlier years of Turner Broadcasting that most people won't remember (my personal awareness started from the original Goodwill games). I found this book to be fascinating. My interest in Ted Turner came last year when my interest in American Bison was started as I visited Yellowstone National Park. His name kept coming up in other things I was reading because he owns so much land and breeds Bison on it. Lucky me that his book came out when it did. I got the audio book and I highly recommend it because it is read by Ted himself. I am amazed at his life, and found each piece interesting and my view when I turn on the TV now has changed, he is an amazing guy and only seems to get better with age, I hope he can continue his great work and find happiness for another 70 years, as I think the world is a better place with him in it. It is interesting to see he seems to still have deep love for Jane Fonda. For what ever the reason you are looking into his book, I think you will find something to love or at least interesting about this man. I just finished reading Ted Turner's fascinating autobiography. Turner is a veritable member of a disappearing breed. A no-nonsense fighter, tenacious and doggedly pursuing his set goals. He may have had his foundation laid for him by his father, but it wasn't handed to him, he earned it and multiplied what he inherited a million times over. Without repeating the commentaries of other positive reviewers here, I would like to divert and compare briefly the style of Turner's father and today's parenthood. Despite his weakness as an alcoholic, Turner's father epitomized the ideals of real fatherhood. A strict and authoritative figure as well as a good provider, he instilled the needed virtues for success in his son very early. I am afraid that if he were alive today, he would be accused of child abuse, humiliated publicly and hauled off to jail. Yet discipline is exactly what is urgently required to raise children today. Boys are now raised to be effete and emasculated, they are taught to suppress their natural male tendencies. All manners of psychiatrists, psychologists and "experts" are employed to evaluate boys that are naturally aggressive and masculine, fancy new labels are placed on their behaviour and worst of all, damaging drugs are prescribed to "cure" non-existent "hyper-active" conditions. all followers, including himself, to the exponential clatter of communications now extant. Distant Reaches The Hard Copy Edition of True-Life Adventure in Ireland, Boston and on the North Atlantic.